Excess water is the bane of many industrial and manufacturing operations. When too much water accumulates, operations are paused until the water is drained and work conditions are restored. The Prosser dewatering pump is an ideal solution to virtually any flooding problem and gets the job done fast. Prosser pumps are lightweight, portable and small enough to fit in spots that most other pumps cannot. When the water level is too high, Prosser submersible pump products allow you to put the pump underwater to move the liquid away from the job site. Getting the Prosser submersible pump to start dewatering your work area is an easy and simple task because there is no priming required or any suction hose or foot valve to operate. Simply place the pump where you want the water removed, turn it on and let the pump do the work. The pump’s inline design ensures the motor runs smoothly and stays cool while keeping noise levels to a minimum. 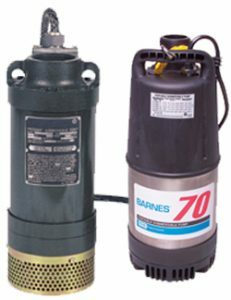 Even when the water is fully removed from the area, the motor will still run smoothly and efficiently without suffering damage. If the job is particularly big, you can place more than one pump in the affected area to ensure the water is removed as quickly as possible. Prosser dewatering pumps greatly outperform other manufacturers’ pumps when it comes to removing water out of cramped and confined spaces. The pump’s slim-line design enables the pump to fit in places where no others can fit. Its powerful flow rate will move many cubic feet of water quickly out of virtually any area. Better still, a Prosser dewatering pump can remove water whether it is level, upside down or placed at an angle. Arroyo Processing Equipment is the best source for a Prosser dewatering pump and other fluid processing solutions for facilities in Florida, Georgia, Alabama, South Carolina, North Carolina and other regions. We have more than 50 years of experience in providing professional guidance and help on a wide range of industrial and manufacturing job sites. Our team of experts at all of our locations are available and ready to assist you, so contact us today! © 2016 Copyright Arroyo Process Equipment. All Rights Reserved.